Denon D-M38DAB review | What Hi-Fi? The Denon D-M38DAB should look familiar to regular readers. It's been around a while, winning an Award in 2010 and again in 2011. And even then it felt like an old friend thanks it looking almost identical to its long-running predecessor, the D-M37DAB. The fact that the M38 continues into another year might seem a bit risky, but Denon is right to keep the faith in its micro marvel. But while the Denon’s been around a while, it isn’t behind the times. DLNA streaming, internet radio and AirPlay have yet to make it down to this level, but you do get a digital iPod connection through the USB socket on the front, which means your tunes are converted to analogue by the Denon’s DAC rather than the iPod’s, resulting in better sound quality. Non-Apple portables can be connected via the 3.5mm jack, and there are stereo RCA connectors on the back along with a subwoofer output. Oh, and it can now handle DAB+, just in case it ever turns up in the UK. We’re reviewing the D-M38 here with Denon’s own SC-M37 speakers, but the main unit is widely available on its own for just £200. If it were our money, we’d buy it with a pair of Tannoy Mercury V1s, Mission MX1s, or even the Dali Zensor 1s if we could stretch to them. These will make the most of the D-M38s abilities – but even with the dedicated own-brand speakers the Denon’s sound is a cut above. The secret to its success is pure and simple excitement. Play The Chemical Brothers’ awesome Swoon and the Denon pounces with puppy-like excitement. There’s so much punch and attack to the delivery that you can’t help but be thrilled by the rhythm. The precision with which notes start and finish is really very impressive, too, especially from a system costing so little. Brilliantly judged treble is another one of this Denon system’s major strengths. It’s nice and lively, but as long as you don’t push the system to ridiculous volume levels, it’s also just on the right side of brightness. The amount of bass you get will depend on how close to a back wall you position the speakers, but we suggest leaving just a few inches of space to give you the best tonal balance. Whatever you decide, while the Denon doesn’t reach exceptionally low, it is tight and controlled. 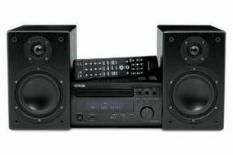 A small system like this can’t project sound or fill a room quite to the same degree as a bigger, more expensive unit, but in every other way the Denon easily surpasses expectations, making it one of hi-fi’s true bargains.